7" & 12" singles (except Argentina 12") Argentina 12" single UK cd-single Japanese 3" cd-single UK cassette-single Argentina cassette-single UK 7" single back UK 12" single back UK cd-single, inside Japanese 3" cd-single back UK cassette-single panel UK promo 12" USA promo cd Japan promo 7"
Some copies of the UK 12" and cassette maxi-single were mispressed with "Ordinary Boys" instead of "Hairdresser On Fire". The Argentinean 12" and cassette single are titled "Rapado", which means "Suedehead" in Spanish. A remix of the title track was released as a single in 2012. For information on the latter release, see here. Morrissey. The original photo was taken by Geri Caulfield at the London Palladium concert in October 1986. UK: This single was promoted in the UK with the help of the first in a series of promo 12"s in glossy record bags of different colour. The "Suedehead" bag is blue and is the only one in the series to be numbered (EMI 12POPDJ1618; view left). Copies of the stock 7" were sent to radio with a press release and a Parlophone promo sticker on the back. Copies of the 12" (stock or promo) were supposedly mailed out with a promo poster inside. Copies of the stock 7" single and cd-single have supposedly also been distributed with a non-EMI/Parlophone promo sticker on them. 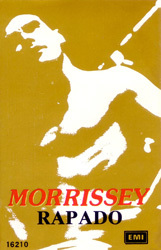 A one-track promo videocassette of the title track was produced by Double Vision and dispatched to the usual networks. The video was also included on two different instore video compilations, one on Parlophone dated March 88 and a 22-track one on EMI titled "EMI Instore no. 20". 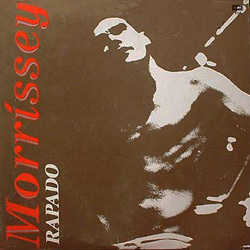 Argentina: Copies of the "Rapado" 12" have supposedly been distributed for promotion, although it is not known if these were white labels or stamped stock copies. 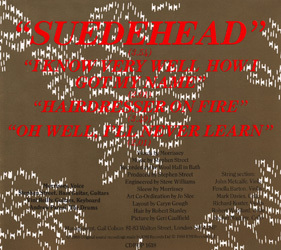 "Suedehead" was included on two different 6-track various artists promo EPs sent to radio at the time of the single's release. One was numbered DIF010 and the other DIFLP015. A promo LP titled "Imagen De Radio" (EMI 10056) also included the song. 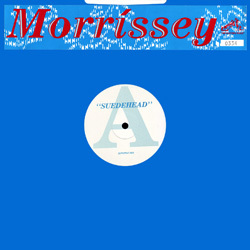 Brazil: A promo 12" (Parlophone 9951077) was printed with "Suedehead" on both sides. However that song was never released as a single in that country. This 12" was used to promote "Viva Hate". Canada: Gold-stamped copies of the stock 12" and an edition of the 7" with promo text on the label were used for promotion of this single in Canada. Unlike the latter item's American counterpart which featured the title track on both sides, the Canadian promo 7" was backed by "I Know Very Well How I Got My Name". France: The sleeve of stock 7" copies were stamped for promotion. Germany: The EEC 7" was sent to radio with a 'fact sheet' in German. Japan: The 3" cd-single was promoted with the help of two items: stock copies of the cd-single with 'SAMPLE' stamped on the disc's inner ring and a specially pressed promo 7" (PRP-1275). 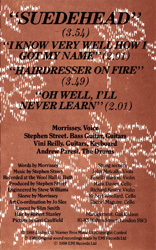 The latter item features "I Know Very Well How I Got My Name" on the b-side and is usually paired with a photocopied release information insert. South Africa: One-sided promo 7"s (EMI PS100) of "Suedehead" were printed for promotion of the "Viva Hate" album. 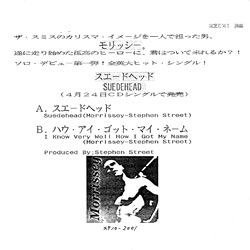 "Suedehead" was never released as a single in that country. 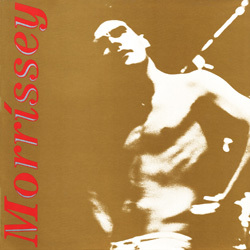 USA: Gold-stamped copies of the stock 12" and a promo 7" (Sire/Reprise, 7-27907-A) were sent to media and retail to promote Morrissey's debut solo single in the USA. 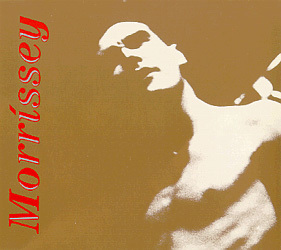 The 7" features the title track on both sides and is circulated inside a generic record company sleeve with no artwork. 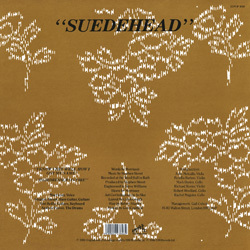 A one-track promo cd of "Suedehead" (Sire/Reprise PRO-CD-3013) was also sent to radios in the USA, but this item was used to promote "Viva Hate" more than the "Suedehead" single (view left). A one-track promo video (Warner Bros DP705) was dispatched to the relevant media. 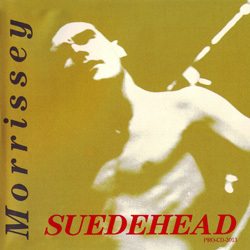 A different Warner Bros video featured the "Suedehead" video with four videos by the Smiths (Warner Bros A57544). 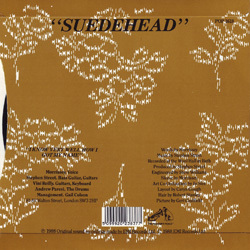 The "Suedehead" video was also included on two various artists Warner Bros compilations, one featuring 5 other artists and dated "04-28-88" (date to be confirmed) and the other one featuring 13 tracks and dated "04-14-88". 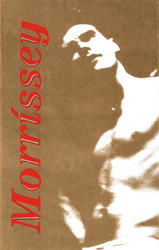 The video was also featured on the April 1988 issue of the Rockamerica video series aimed at club play.